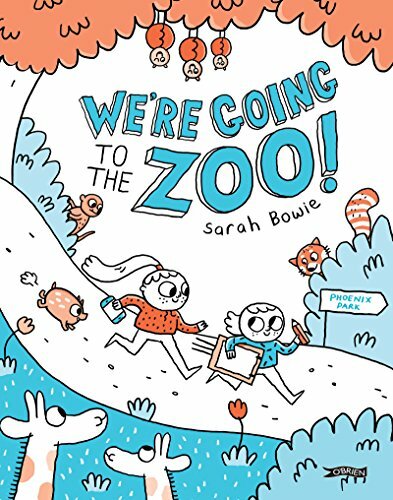 A day out at the zoo is the primary subject of Sarah Bowie’s witty picture book, but beneath the description of a family’s adventures is a wealth of ideas and provocations. It’s the summer holidays and Dad suggests a trip to the zoo. Kitty is really excited, her teenager big sister Clara finds the idea really boring, but then everything is boring to Clara except for texting. When they arrive, Kitty decides to draw pictures of all the animals, which Clara thinks is weird, why not just take photos. But Kitty’s pictures are more than just images of the animals; she catches their personalities, adds notes and extra bits of information. Eventually, despite protesting that drawing is for babies, Clara joins in too. The sisters remember the days when they used to have drawing competitions, and Clara’s grumpy teenage mood disappears completely. The mix of family relationships, tech versus old fashioned methods, and animal information is very neatly done, and Bowie’s cartoon-style illustrations capture Kitty and Clara’s characters perfectly. I particularly like her depictions of Clara in her moodiest teen strop. There’s lots to talk about, lots to get children thinking, and it makes the idea of drawing to convey information or to map out your experiences really appealing.